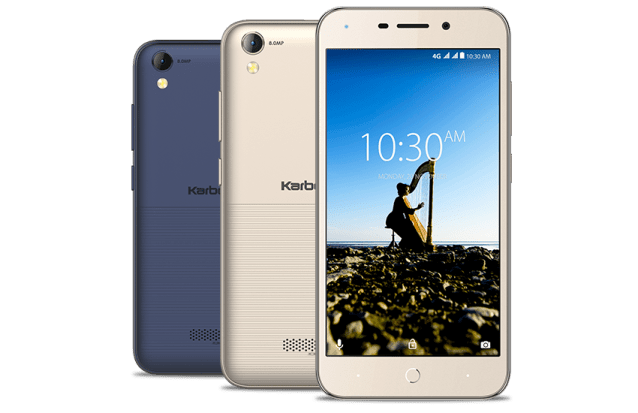 Home spawned mobile manufacturing company, Karbonn has come up with its latest device- K9 Music 4G smartphone retailing for Rs. 4,990 in the country. With the feature of dual speakers and 3 months of free unlimited music download on Saavn App, the device seems to target the music enthusiasts who like to enjoy their groove with unmatched clarity. The other specifications on the device are modest, suited for a budget bracketed smartphone. There’s a 5-inch FWVGA display (480 x 854 pixels) with capacitive touch, powered by a 1.3 GHz quad-core processor with 1 GB RAM. Its 16 GB of internal storage is expandable to up to 128 GB via a microSD card. Further on the phone supports dual-SIM functionality and runs on an Android 7.0 Nougat. Providing the juice to the device is a battery backup is 2200 mAh with a stand by time up to 180 hours and talk-time up to 8 hours (2G). Karbonn is offering the device in two variants of Blue and Champagne colors with a premium finish. As for the camera features, K9 Music sports an 8 megapixel rear camera with auto focus and LED flash and a 5 megapixel front selfie shooter. Accompanying options on board include- panorama shot, continuous shot, face beauty, night Mode, face detection, self timer, filters mode, HDR etc. While the connectivity options on the device include- Bluetooth, Wi-fi 802.11 B/G/N, Hotspot, Micro USB, OTG Support, GPS and FM radio. The device seems to be a good option for music maniacs in the budgeted category; however most of its other features seem to be average compared to other devices being offered in the same bracket. Karbonn K9 Music would retail for Rs. 4,990 in the country.